In the world of materials handling equipment, it’s nice to have the distinction of being the first. That is Clark’s claim to fame. Back in 1917, the Colfor Tool Company in Buchanan, Michigan, which became the CLARK Equipment Company, responded to a need to move materials between its various axle, drill and wheel departments. The employees conceived the first “Tructractor” and the prototype of today’s forklift was born. The Tructractor was the world’s first internal combustion-powered industrial truck. In 1918, eight Tructractors were built and in 1919 over 75 were manufactured. Around the same time, the Yale Lock Company was developing a similar product, but Clark was first on the scene. Incidentally, in 1997 the one-millionth CLARK truck was produced. This model CDP25H Megastat is now on permanent display in Clark Material Handling Company’s showroom in Lexington, Kentucky. But even better than being the first is still being around today, and being considered the BEST. Clark may be blowing its own horn, but it is hard to deny that it has not only kept pace with industry trends since it created the first lift truck, but it has led the pack through research, development and innovation during its almost 90 years in the materials handling business. The Clark Materials Handling Company has adopted the slogan “Built to Last.” The company produces one of the world’s best forklifts by implementing the latest production techniques, coupled with the ideas and efforts of its highly skilled engineers. To maintain the highest level of quality, Clark has adopted a centralized quality control system which oversees the production from the initial development to the assembly stage. Today, Clark is a part of a multi-product international company called The Young An Group, which has an annual sales volume of over 1.5 billion US Dollars. 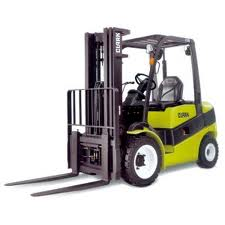 The forklift section’s turnover in recent years fluctuates around 250 million US Dollars annually. For the customer looking for a quality materials-handling product, CLARK has history, volume and sales on its side. Worldwide, CLARK has one of the broadest product lines in the industry with five major lines: Trucks ranging from 1,500 to 18,000 pound capacities, LPG, gasoline, dual fuel, diesel, narrow-aisle stackers, electric riders and powered hand trucks. Presently, there are over 250,000 CLARK lift trucks operating in North America and 350,000 units operating worldwide. CLARK was the first forklift manufacturer in the world to be certified in compliance with the internationally accepted quality standard ISO 9001 for all its forklift manufacturing plants worldwide. CLARK’s on-going commitment is to have the Number 1 Quality system in the industry. CLARK’S Korean facility acquired its ISO 14001 (Environmental Management System) certificate in 2001. Clark Material Handling Asia was created when Clark Material Handling Company took over the forklift division of Samsung Heavy Industries in 1998. In their Changwon, Korea facility they design, manufacture, distribute and support 1.5 – 7.5 ton IC forklifts and 1.0 – 3 ton counterbalanced and reach machines. The facility employs over 460 people. The Seoul office houses domestic and export sales along with the Finance Department. A complete engineering test facility is also located here, which allows performance testing for the next generation Clark products. The plant utilizes “Just in Time” and KANBAN, for lean inventory, which lends itself to a much cleaner, uncluttered and efficient work environment. Clark’s North American Headquarters in Lexington, KY is located on a nine acre campus featuring two buildings: one houses sales & marketing, customer service, engineering, aftermarket service and support, finance, purchasing, research & development, and manufacturing. In addition, this building features a product showroom to showcase Clark’s extensive product line as well as a 5,200 square foot training area designed to support and train Clark’s over 220 North American forklift dealer locations. In 1999 Clark opened their 180,000 sq. ft. state-of-the-art parts Distribution Center in Louisville, KY. Design, operational parameters, and personnel were combined to create a world class parts distribution facility which is centrally located to serve all of Clark’s North American dealers and customers. The facility is directly managed by Clark employees, resulting in cost savings and performance improvement. CLARK Dealers are also the local source for all parts needs through CLARK TOTALIFT. Availability of parts through CLARK TOTALIFT covers over 120,000 items specifically built for 20 different brands of lift trucks and other industrial equipment. As the first Materials Handling Company, CLARK has earned its place in the front of the class. Its commitment to research and development and its investment in technology has ensured not only its survival for almost a century, but guarantees its consistent sustainability and leadership as a charter member of the industry.